While working together with Larienna on a game concept and templates (TBA), I was struck by what I think is a nice, little idea. Now i just wonder - what do you think, is the market already over-saturated? Is the idea unique, or does it sound like a copycat? What happens when you put the old computer game Archon, the discontinued WOTC game Dreamblade and a bit of Summoner Wars and Mage Wars into a blender? * each creature features at least one special ability, up to three at max. one ability is always a magic spell that can be cast and allows you to use your creature in a different way than just attacking/moving. so each creature is basically a creature-card and a spell-card in one. * combat uses dice: each player rolls 2d6 and adds his creatures power. the player with the higher total wins and deals one damage to the opponents creature. * the game would be easy, fast, cheap, non-collectible but expandable and probably available for print-n-play. the art would be cool, but non violent and therefore also suitable for kids. * Finally, see the attached sample templates. thats it, in a nutshell... any thoughts on this? thanks! I like the idea, but so far, I have not found a way to make summoning creature on the map interesting to play. I hate summoner's war, and I tried exploring a game with hexes and DM cards like on the picture below and it failed. So their is probably a key rule I was missing to make the game interesting. In LOTR confrontation, I think what makes it work is that all units stars on the board and you have hidden information. I do not necessarily prefer it this way. I even had an idea to have a chess like game with various creature configuration, but again, all units started on the board. Even in archon, all units start on the board. But I think why it works is because there is not that many playing space on the battlefield. well, that is in fact a problem with lots of "build your forces" type of games. Dreamblade was also very slow during the first turns, and I know several RTS games on the PC that suffer from the same problem too. But, i have tested this concept already (its based on a very old concept of mine) and came to the conclusion that it works. It was planned not to start with the full force in play. Why does it work? Im a bit concerned about the combat system (2d6+strength VS 2d6+strength). maybe split up attack and defense. maybe reduce to 1d6. im not sure yet. the main reason for 2d6 is that it allows me to have "blade abilities" like in Dreamblade. This means, for every 6 you roll you can trigger a special ability written on the card (instead of using the value 6). if you have no special ability, you just use the value 6. some abilities require 1x6, but others require 2x6 to be activated (hence 2 dice are thrown). no one else with any thoughts on this? EDIT: added three more sample images (links, as i dont know how to post images directly in the post) (note that this is not a completed game, just design concepts). I think a rock/paper/scissors mechanic was always underplayed with table top games. Although I do know that a rock paper scissors mechanic can be a little simplistic, maybe you can go with the rock-paper-scissors-lizard-spock. Personally, I feel like too much dice rolling can really hinder the pacing of a game. If i want randomness in my games i try to add it via card draw instead of dice roll. Sure the probability of you getting what you want is lower, but it lets you at least have a coherent strategy as the game goes. I was going to incorporate something like that RPSLS in my own war game, as in each thing beats 2 ties 1 and looses to two. maybe it's something worth considering so the game keeps moving. Also, I think for a proper tabletop RTS to really work, it needs to start with some sort of unit configuration on the board. Maybe you can give players enough starting resources to have a few units aside from the standard starting units in there. as stated in my second post, im also worried about the dice rolls. in fact, there was a earlier version of my concept that used no luck element at all. but previous test plays as well as advice from people on the internet showed me, that most players like to see dice in a table top. otherwise it plays a bit too much like chess. any more thoughts are welcome! You could use something like my lord of the ring confrontation variant. Roll 1 die for each point of strength the creature have. Keep all dice greater or equal the target number. The player that kept the most dice wins. In case of ties, both creature dies. Simple system that could work pretty well for your game. I see a problem with the occupation of the center hex row. Perhaps if you score points at the end of every turn this may work; the player to occupy a hex at the end of turn gains its victory points. The other problem is that each player is only concerned with occupation of that center row, which is AKA king of the hill. There is no incentive to move into "enemy territory" to do battle. 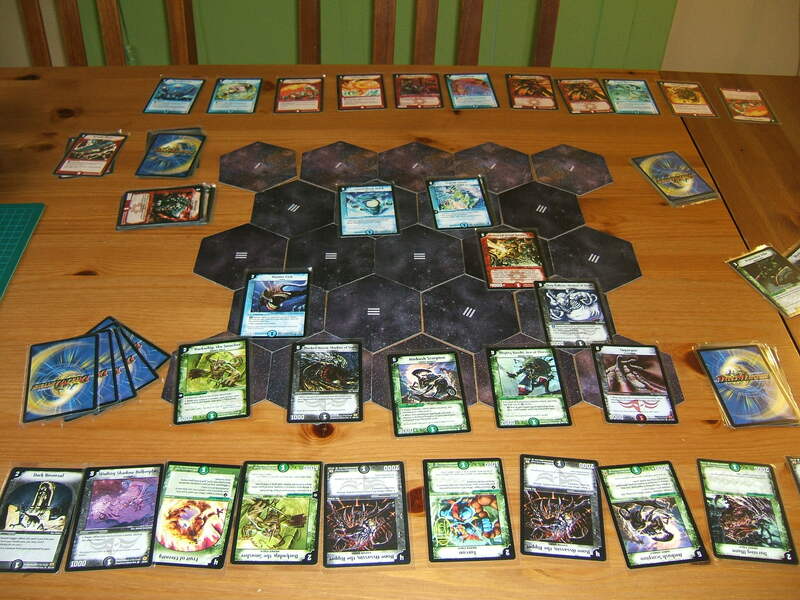 Perhaps you could scrap the board and just have duels against monsters for control over a row (the floor so to speak). @larienna thanks, you are always very helpful! right now it is: 2d6+strength. I have not chosen a target number system because summoner wars does it that way. but your point is good, will have to think about it. 1. check victory points at end of turn. 6 points win the game. A. +1 for each creature destroyed this turn. B. +1 for each point of power you occupy. 3. the player with the higher total, gains 1 victory point. In the link with *template* it says that "Health" is under *Power* (On the top left-hand side). But in the sample cards, there is no "Health"!? But yet on two (2) of the cards (White Mage and Manticore) in the *Abilities* section, they talk about "being able to sustain additional hits". Can you explain all of this... because it seems very inconsistent. I think the concepts are interesting - but there seems to be some things which are confusing. BTW is the character artwork your own (White Mage, Manticore, Black Knight)??? I can partially reply to this. He has an artwork bank that is somewhat Public Domain that has been made by somebody he knows. We are going to use the same artwork for our game, or maybe temporarily, because our game has a CCG feel, and with no artwork, it will be hard to differentiate the cards. Well one thing that I do know is that The Game Crafter has *Mini cards* which are 1.75"x2.5" and even smaller are *Micro cards* which are 1.25"x1.75". You can have two options: have 2 decks, one with the smaller cards which simply refer to the card and then the normal poker sized cards. One COOL thing about this idea is that it keeps HIDDEN the abilities of the creature from the opponent. Obviously experienced players may know the special abilities of creatures because they play often, but still I think this is a *sort of Hidden Information*. And since each player can customize the creatures they play with, they may not always have the card on hand to check what the opponents creature abilities are. You might want to use those type of stands in your game. But what I don't understand is "We are going to use the same artwork for our game". Who is WE? And what game are you talking about that has a "CCG feel"? Where does the name "Crystal Archon" come from? I think the logo on the cards looks nice - but I wonder about the name. I don't get why *Crystal* is used in conjunction with *Archon*. I see there are crystals in the artwork (cards) and concepts like "Crystal Mining" (?). What I like is the idea of customizing your game from a pool of creatures. This is nice - adds a lot of replayability. It also opens up the possibility of expansions to the game (which is always good). I would not make it *Light vs. Dark*. This is what the OLD game was about. I would find something other twist. You could use a RPS-5 I have developed: Green (Terra) - Blue (Aqua) - Red (Ignis) - White (Solis) - Black (Lunae). Green are Earth creatures, Blue are Water creatures, Red are Fire creatures, White are Life (Sun) creatures and Black are Death (Moon) creatures. I have the RPS - but no reason to apply it to any game in particular. Life creatures can be Unicorns, Pegasis, Humans. Death creatures can be Basilisk (Petrification), Werewolf, Vampire, Undead. Fire creatures can be hellish like Demons, hellhounds, Dwarves (Fire/mountains). Earth can be Druids, Driads, Elves. Water can be Sirens, Sprites, Merfolk (Mermaid, Merman). Could be something like Archon: Circlet of the Heavens. A circlet is a circular band made up of precious materials and it is worn on the head. It could be the PRIZE the winner is trying to WIN. Jewels can be: Emerald (Green), Sapphire (Blue), Ruby (Red), Diamond (White), Onyx (Black). Again just ideas that I am coming up with thinking what I think would be cool in the game. They are just ideas (to think about). Not sure about the *Mana* part: how do you EARN it? Maybe you should EITHER Move or Attack. Why? It allows for defensive play. You can retreat if a more powerful creature is trying to *kill* a weaker one. Worth thinking about. Makes it a little more like chess (or the original Archon). I don't know - because I did not read about this - but you should consider the concept of RANGE. Each creature has a range of attack - like 1 hex, 2 hex or 3 hexes. Maybe for spells or abilities. More to think about. The RANGE of a creature should be indicated on the *Micro* card (Placeholder) so that the opponent can figure out how he is being threatened. Lower range = higher defense or health. The nice thing about the RPS-5 is that creatures are vulnerable to another category of creatures. So to defend a particular *win hex* (you call them "special hexes") you need to plan accordingly. I think this would add DEEP strategy... And HERE IS THE KICKER: you could borrow the *Hidden Information* of the game "Stratego". Your concept has "*during your turn, you summon creatures onto your side of the board (your starting row or portal row)"
You could consider having a SPECIAL Pawn which is YOUR Archon. You could summon a creature NEXT to your Archon Pawn. Archons could have different capabilities which make it that they can move MORE hexes than creatures... Archon Pawns cannot be attacked or defeated. This makes it easier to manage 5 win hexes (you have 7 special hexes). 18 / 5 = 3.6 (so between 3 to 4 creatures per hex). Enough to make it that you don't have ALL 5 colors at a location (win hex). 1. ART. Art is public domain, its from a friend (nickname Thalzon) who painted it for a computer game. its large enough to be used in PnP games as well. He allows uncommercial and commercial use of it. Still got no reply from him if im allowed to share the art. 2. HEALTH. The sample cards are older versions (this is an old concept). The newer version uses "dots" to represent health. the red template is the most recent one. 3. CARD SIZE. Ill stick to poker size, the gameboard is big enough. did a few tests on other games and found out that any other card size is bad (players not used to it, bad shuffling and most important: unable to use sleeves). especially for PnP you need cards that can easily fit into sleeves. also: when testing other games, I used hex tiles or big, round tokens in the past. they had a picture on the A side and the rules on the B side. the result? players complained all the time that they had to flip the tokens in order to read the rules. well..learned my lession! 4. WE/OUR GAME. well, thats still top secret (not related to this project). 6. YOUR IDEAS. good stuff in there, have to think about it. 7. MANA. Ill explain later, it uses the same system as the Duelmasters CCG. 8. RANGE. its in, as a special ability. 9. STRATEGO. haha - another concept of mine was to blend Archon with stratego actually! 10. SUMMON. no static units - you summon them to the board instead. like in Dreamblade. I have tested this and it works like a charm. starting with all units in play - did NOT work (well it works, sort of - but i have to change the whole rules again). 11. ARCHON. no, YOU are the archon (the player). i dont want to focus on a central character (this is how mage wars does it). but there is a wizard character for each element, that is quite powerful and features a cool special ability that incorporates spells into the game. 12. WIN HEXES. you dont have to occupy all winning hexes. just some of them is enough, you gain victory points by controling these hexes. 13. FINAL TOUGHT. you start with lots of cards in your hand, thats your selection of units. but you will only be able to summon a subsection of these units onto the board to do battle. this is like playing a CCG with your whole deck in your hand (it will be smaller though). cards are not drawn etc. - just used as position markers and for reference. thank you questccg for your detailed feedback, there is lots of wisdom in there! "But what I don't understand is "We are going to use the same artwork for our game". Who is WE? And what game are you talking about that has a "CCG feel"?" Yes, I am co-designing with Fhizban. We are not ready yet to make any announcement. The only clue I could say is that all the clues to find the answer are in this thread. But please do not PM me to know if you have the answer, I won't tell. "Take the old computer game archon, translate it into a boardgame. Add elements and warp the setting into a "phantasy star online" like far future. Then put everything on steroids and stir continually." " Since the Ascension, the universe is the hard-fought place of Technomagi. Besides their schemes and secret agendas, they fight a power struggle for the most valuable resource that is known to sentiment beings: Crystallium. This substance fuels all Magitech, an invention that grants godlike powers by fusing magic and technology. Mighty legions and armadas of spaceships became obsolete within the blink of an eye, as the Technomagi tapped into the possibilities of Magitech. In the far away future, battles are fought and decided by a selected few instead. Accompanied by their Minions, Technomagi strive for nothing less than ultimate rulership over the universe. And Crystallium is the key to victory… "
In "The Magitech Wars" - players take the roles of mighty Technomagi - competing to claim Crystallium Sources on the plane, through skirmish battles. Using customized Vaults of cards, a hex-tile gameboard, six sided dice and tokens, they let their minions fight to become the emperor of a fictitious multiverse. From turn to turn the players summon Minions and move them around the board to let them battle. Players gain crystals by putting some of their Minions into the resource zone, and win the game through gathering six victory points. Those points are scored by controlling the most Places of Power on the gameboard, or by banishing enemy cards. I like phantasy star. That could be a cool theme. Quick idea: Instead of accumulating victory points why not use a system like 1812. Each crystal controlled gives you 1 VP non cumulative. The players need to trigger a certain event for the game to end. When the game ends, the player who currently control the most VP area wins. The concept of 1812 is that city captures goes back and forth between Canada and US. It's very hard to defend everything, so you are always vulnerable somewhere. But if you have a strong difference with your opponent score, you could try to pass the truce and once it passes, the player with the most points/cities win. The worst case scenario I have seen is canada having a 5 point advantage (which is a lot), so canada passed the truce but they lost at the end of the turn because US captured 6 points in 1 turn. thanks for the heads up larienna! right now the sytem is balanced, its based on an old game concept of mine. tested and refined it very much, back in the days. C. gain 2 VP for the center crystal. you keep track by putting creatures face up in your graveyard and then turn them face down at the end of your turn (after VP calculation). but your idea sounds good. now i just wonder how this event triggering is supposed to work. can you post 1-2 examples? in 1812, one of the movement card is a truce. So eventually, the truce is going to happen because the card will have to get played. Because in that game, you place a mobilize card each turn ( which has various effects). Another idea could be to have some sort of clock like and event deck where players can manipulate the depletion speed or the content of the card. For example, in Starcraft, there is 3 end game cards, and when 2 of them are drawn the game is over. You could allow players to cycle the deck faster, or allow them to stall the deck, or even return an end game cards. Again in starcraft, "Stalling Tactics" reshuffle the card in the deck. While another accelerate the process by making you draw and extra card. cool stuff, only one problem: there is no deck in this game. instead you start with all cards in your hand (thats 24 per player). its strange, i know - but it works like a charm. Just a quick announcement that the free PDF Rulebook for “The Magitech Wars” has been released. Head straight to the download section and grab your copy. Be sure to read the rules thoroughly before the Nexus Core Set is released (wich will be soon)! I never tried yet a game where you have access to all your spell in your hand. The problem I was expecting is to have a dominant strategy where you always play the same combo or your stronger cards first. I think it works, the original concept started this way because it was intended to use miniatures instead of cards. A system like also worked in WOTCs discounted game Dreamblade.